Animals, plants, and fungi are the three major multicellular groups of the domain Eukaryota. Eukaryotes are organisms with complex cells which have features such as mitochondria and nuclei, and only Domain Eukaryota has evolved to have members consisting of many cells (although some eukaryotes, such as Amoeba and Paramecium, are single-celled). Many fungi are superficially plant-like organisms. They grow visible structures that resemble plants or plant parts. On a microscopic level, plants and fungi both have cell walls, a feature that metazoan (animal) cells lack. 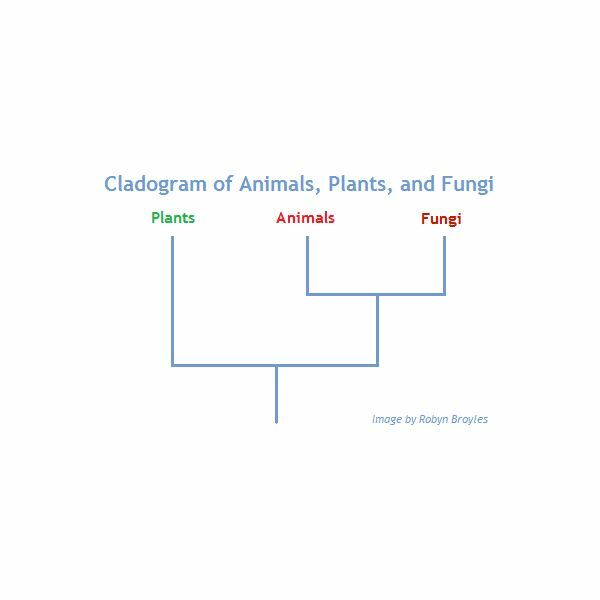 The study of cladistics, however, results in a phylogeny tree in which fungi are more closely related to animals than to plants. In other words, animals have a more recent common ancestor with fungi than with plants, and the mushrooms in your salad are more closely related to you than to the lettuce. Some fungi are single-celled organisms, such as the yeasts. All metazoans, on the other hand, have multiple cells. Even the simplest animal, the sponge, consists of many cells specialized for different tasks. All animals are motile, that is, able to move independently, at least at some stage of development. Even sessile, immobile animals such as sponges and corals have motile larvae. Fungi, on the other hand, are not able to move independently. Many types of tissue are unique to animals, such as muscles and nerves. All of these differences are either superficial (such as the fact that some fungi are single-celled) or they are a result of evolutionary changes that took place after the fungus and metazoan lineages diverged (such as motility). Cladistic analysis has demonstrated that despite the differences, animals and fungi are more closely related to each other than they are to plants. The most obvious similarity between fungi and animals is their trophic level, that is, their place in the food chain. Neither fungi nor animals are producers as plants are. Both must use external food sources for energy. Fungi and animals share a molecule called chitin that is not found in plants. Fungi and many invertebrate animals use this complex carbohydrate for structural purposes. In fungi, chitin is the structural component of the cell walls. In animals, it appears in hard structures such as the exoskeletons of insects and the beaks of octopuses and other mollusks. On a molecular level, chitin is similar to the plant molecule cellulose, used in plant cell walls and other structures, but the chitin molecule has a modification that makes it stronger than cellulose. By studying a large number of features found among various members of Domain Eukaryota, taxonomists have developed a phylogeny tree called a cladogram that places fungi together on a branch with animals, separate from the branch for green plants. In fact, several different diagrams of Animalia, Plantae, and Fungi phylogeny exist, differing in some details. For example, some place the group of algae-like organisms, Microsporidia, within Fungi, while others place it between Fungi/Animalia and Plantae. But all place Fungi closer to Animalia than to Plantae. The lesson from cladistics is that sometimes superficial resemblance is not a reflection of phylogeny.